Fire Force Vol. 7 Review – AiPT! Company 8’s roster shifts in dramatic ways. After some intense fighting, it’s time to shake things up a little in this series. Time to add in both a new character and one we have seen before but weren’t expecting. Is this volume good? Coming off a hard battle, Company 8 finds itself gaining a new, mysterious member from the shady Haijima Industries. However, with this new sudden recruitment, they decide to try to secure another member of their own accord: a talented machinist by the name of Vulcan. He’s just the guy the group needs, but with his deep hatred for both the Fire Force and Haijima, winning him over will not be easy. After what felt mostly like an action-oriented outing last time, Fire Force Vol. 7 feels like a better weighted edition to the series. There’s a nice mixture of story progression, characterization, some surprising world-building, and action all packed in. There’s a little of everything here, making for one of the tastiest and most filling volumes in the series. In regards to its story, this volume is mostly focused on recruiting Vulcan to the team, as well as the trouble that comes looking for him. Despite the big cliffhanger in the last volume with introducing Viktor Licht into the cast, he’s not really the focus here at all. He’s only in the book for a chapter, and the rest of the page-time is centered around Vulcan and his family. That’s not an issue for me personally; the pacing is faster than the last arc and it gets even faster as time goes on. We get into some interesting developments and reveals here as well, tying back into early moments in the series and also expanding upon characters’ histories and places in this universe. I think the only problem with the story is that a few reveals weren’t as strong as they could have been due to us not knowing some of the cast very well. My god, I never knew how stimulating the bottom of people’s feet could be! Character-wise, there is a lot to like here. There are fewer characters present, but most of them get a bit of focus and equal time for development. The one exception is Iris, who feels like a tag-along who doesn’t do much of anything or have any moments of characterization. The big stuff we get with the main characters is with Arthur for once, providing insight into how his mind and powers work. He’s an idiot like always, but his obsession with knights and the image of them plays into his mental image of himself and how he acts. The more he looks like a knight, the more confident he is in himself and the stronger his powers become. Shatter this image and he loses confidence and his powers weaken. This is certainly still played up for comedy, but you also can’t help but wonder how he got to this point. Most of the characterization in the book goes to Vulcan, the people close to him for one reason or another, and Viktor Licht. As previously mentioned, Viktor is only in the book for a little while, so it’s hard to get a grasp on him. His goals, which he mentions line up with Joker’s, are towards justice as he puts it. What exactly this means is anyone’s guess, especially since he seems to know a lot more than he lets on about Shinra. He’s a wild card amongst the heroes, and outside of his creepy enthusiasm for research we are not going to know much about him for a while. With that said, in a series that always seems quick to reveal its cards, it’s nice to see something being held back for a bit. Vulcan is the main focus here and he’s probably one of the most well-defined characters we’ve had. A young mechanic that everyone is after for his incredible skills, he lost most of his family when both his grandpa and dad turned into Infernals simultaneously. Since then he’s been trying to keep their dream alive, wanting to create a new, eternal power source that can bring life back to the world and support animals that had long gone extinct before the Solar Era. He’s grumpy and a bit eccentric, also pushing away an organization that wants him to join them due to his family’s history. He has a strong heart and cares a lot about people however, taking in Yu and Lisa when they have nowhere else to go. All around, he’s a well-established character that’s easy to like and understand, perfect to add to our fun cast of characters. The other people that connect to him are Yu, Lisa, and Dr. Giovanni, Company 3’s Fire Captain. There’s spoilers surrounding two of them, so keep that in mind. Yu is a young kid that Shinra saved back in the second volume and is an apprentice of Vulcan. There’s not a lot to him other than being very trusting and caring a lot about Vulcan, wanting to help him out and make his dreams a reality. Dr. Giovanni is an old apprentice of Vulcan’s grandfather who left the moment the grandpa and dad went up in flames. 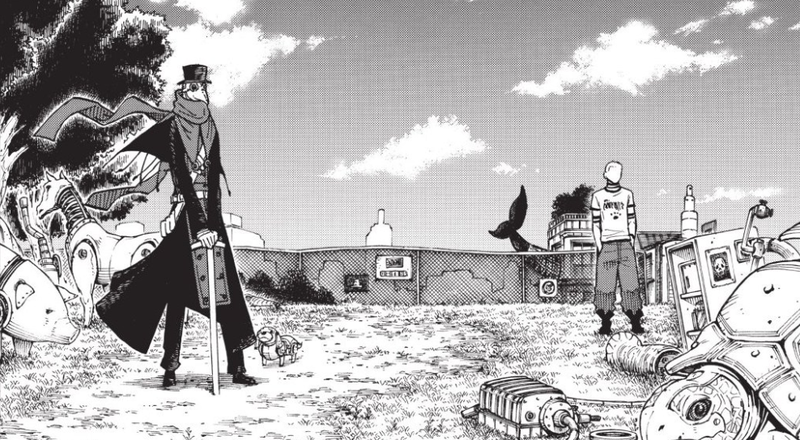 Initially seeming like a shady Fire Force Captain who just wants to expand his group’s power, it turns out he is a loyal follower of the Evangelist and is after the key to Amasteru, the nation’s power plant that keeps everyone alive. He’s ultimately very cold and methodical, trying to plan for every situation and adjust himself to whatever comes at him, making him a dangerous foe. While stoic and calm usually, he’s prone to violent outbursts and intense brutality when he doesn’t get his way, adding to his lethality. He also seems to be part-cyborg, given his mask and detachable hands. Then there’s Lisa, a girl with nowhere to go after her family went Infernal. Vulcan found her living on the streets and offered her a home, which she gladly accepted. However, in reality, she’s a spy sent in by the White Hoods to search for the key to Amasteru and she betrays him once there’s an opening. Her betrayal lacks a bit of power since she was only just introduced and the manga did seem to telegraph that there would be a surprise twist, especially when the writing really lays it on thick with the happy memories. Curiously though, when Giovanni nearly murders Yu while interrogating Vulcan for information, Lisa does flinch and looks worried for a moment. Perhaps, after all the time she spent with Vulcan, some good did rub off on her. As for the rest of the writing, it is pretty solid overall. The pacing feels a lot better here than in some of the earlier volumes, even if some reveals could have waited a little while longer to happen. The world-building is pretty neat and, honestly, very much welcomed. We haven’t learned much about this universe at all, so I just assumed it was like our world, but with some technical advancements and twists. But here most of the world has been burnt out and wrecked, with only a few countries left (Japan being one of them) and most animal species wiped out. It’s an interesting backstory worth expanding on in detail, giving us another angle to see the White Hood’s motives and to explore how this universe works now. I will say some of the humor here doesn’t translate well, such as puns or jokes based off regions and their dialects. Some jokes can also just be incredibly awkward, like Lisa’s introduction and Shinra’s initial reaction to her. The humor does land often though, like when Vulcan reacts to Shinra being in his home. The artwork is great, but oddly I did notice some cracks and issues. Focusing on the positives, both new and old characters are drawn and designed well. Everyone is very distinct in their appearance, though I can’t help but feel I’ve seen Vulcan’s look be used somewhere else. There’s still some great, expressive character reactions and body language to add to the humor or build upon some characterization. The layouts are fine and the action is nifty to look at, like Shinra trying to track down Giovanni through the forest. There are some really nicely drawn and exciting shots and spreads as well, particularly of the knee to the face and of Vulcan sharing his family’s machine with everyone, that look wonderful under the creator’s pencils. All the usual things you come to expect from the manga are great. However, there are a few small things that jump out at me. For instance, one panel is copied and pasted three times and its use doesn’t feel like it fits the scene. Speaking of which, there’s an odd moment where the artwork makes things look all dramatic with its focus on Shinra’s eyes and greying him a bit. The dialogue here is more casual and upbeat however, trying to make a point about how noble Company 8 is. None of this ruins the book by any means, but it just feels off in a series that’s usually firing on cylinders with its art. Fire Force Vol. 7 is an excellent outing for the series, bringing in new characters, providing some fun action, and hitting you with interesting revelations and surprises. This is a book that does a little bit of everything a good volume of a series should, leaving you excited for more. Here’s hoping the next volume can keep that train rolling. An excellent outing for the series, bringing in new characters, providing some fun action, and hitting you with interesting revelations and surprises.